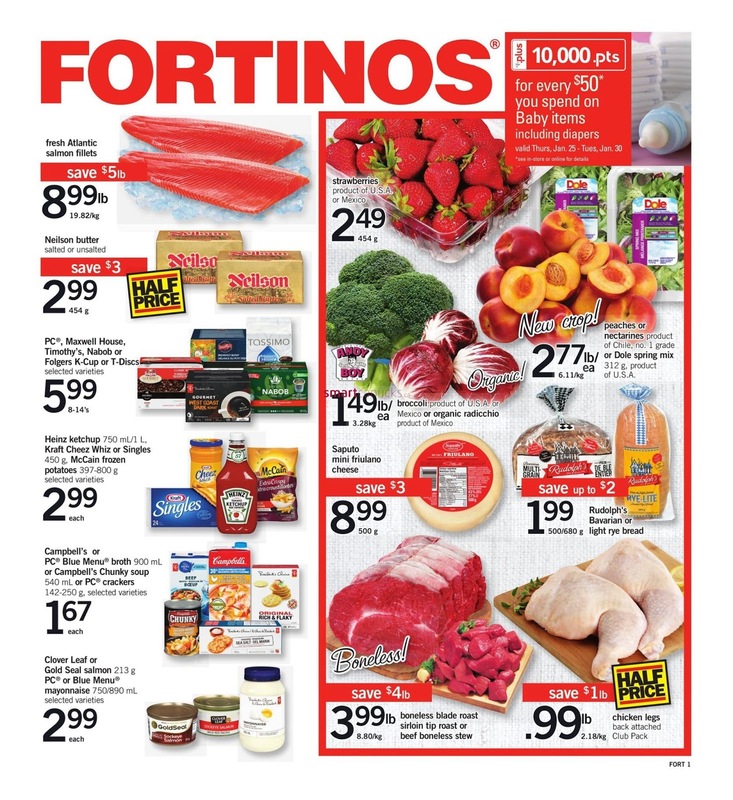 Fortinos Canada Flyer January 25 - 31, 2018 - Fresh Atlantic Salmon Fillets $8.99/lb Sale Price $5.00 Savings $19.82/kg. Pc Maxwell House, Timothy's, Nabob or Folgers K-Cup or T-Disos $5.99 Sale Price Selected varieties. 8-14's. Strawberries $1.99/454 g Sale Price Product of U.S.A. or Mexico. Strawberry Shortcake $30.99 Sale Price $2.00 Savings 1/4 slab. 1.3kg. Pc or Blue Menu Sliced Cheese $12.29/500g Sale Price Selected varieties. Club pack. Balderson Old or Extra Old Cheddar $12.49/lb Sale Price Up to $1.07 Savings By the piece or deli sliced. $27.54/kg. Castello Traditional Blue Cheese by The Piece $14.99/lb Sale Price $33.05/kg. 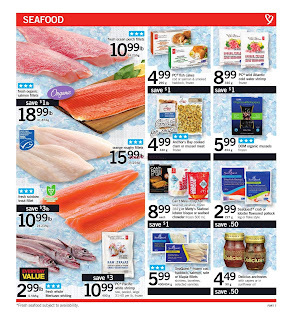 Saputo Provolone $11.99/lb Sale Price Up to $1.00 Savings $26.43/kg. Regular or light, deli sliced or By the piece. Arla Dofino Havarti $11.99/lb Sale Price Up to $1.62 Savings $26.43/kg. Selected varieties by the piece or deli sliced. 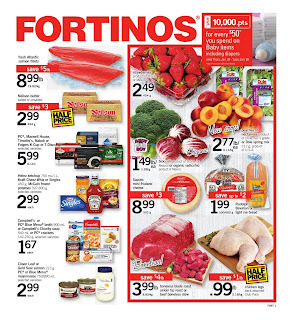 Fortinos Canada Flyer Garlic Cheese or Bruschetta Bread $2.99 Sale Price $1.80 Savings 260/360g. Made fresh in-store! Fortinos Flyer Heinz Ketchup Kraft Cheez Whiz or Singles McCain Frozen Potatoes $2.99 Sale Price Heinz ketchup 750 ml/1 l, kraft cheez whiz or singles 450 g, mccain frozen potatoes 397-800 g. Selected varieties. Campbell's or Pc Blue Menu Broth or Campbell's Chunky Soup or Pc Crackers $1.67 Sale Price Campbell's or pc blue menu broth 900 ml or campbell's chunky soup 540 ml or pc crackers 142-250 g, selected varieties. 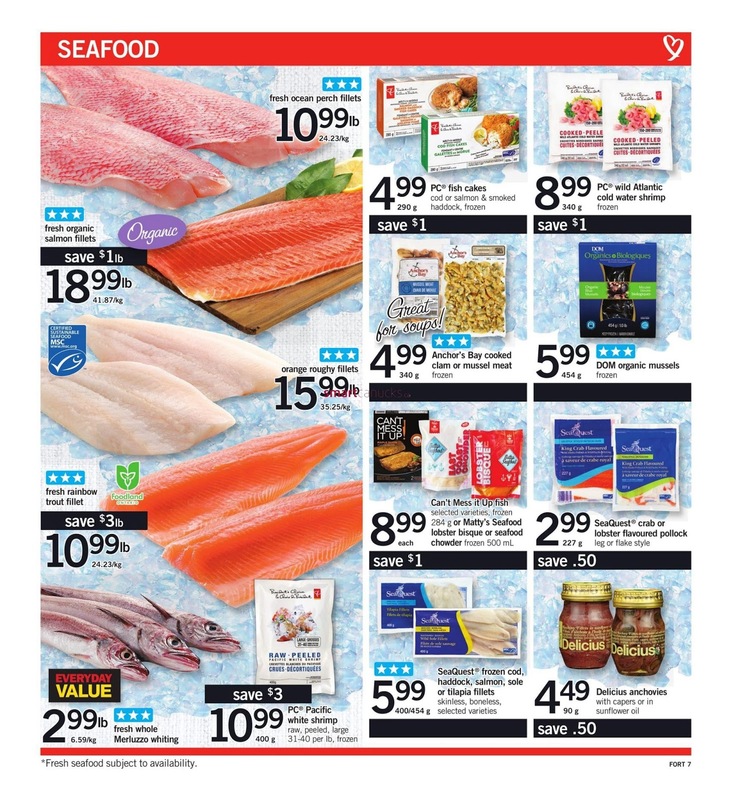 Clover Leaf or Gold Seal Salmon Pc or Blue Menu Mayonnaise $2.79 Sale Price Clover leaf or gold seal salmon 213 g pc or blue menu mayonnaise 750/890 ml. Selected varieties. 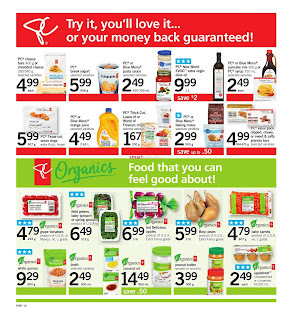 Boneless Blade Roast Sirloin Tip Roast or Beef Boneless Stew $3.79/lb Sale Price $4.20 Savings $8.36/kg. Chicken Legs Back Attached $0.99/lb Sale Price $1.00 Savings Club pack. $2.18/kg. Half price. 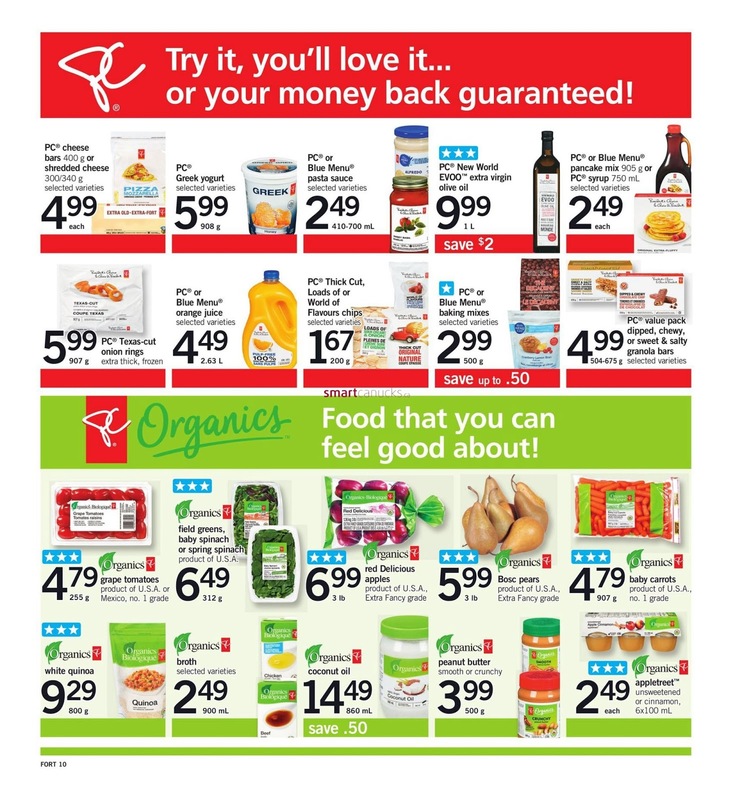 Rudolph's Bavarian or Light Rye Bread $1.99 Sale Price Up to $2.00 Savings 500/680 g. Broccoli or Organic Radicchio $1.49/lb Sale Price Broccoli product of U.S.A. or organic radicchio product of Mexico. $3.28 kg. 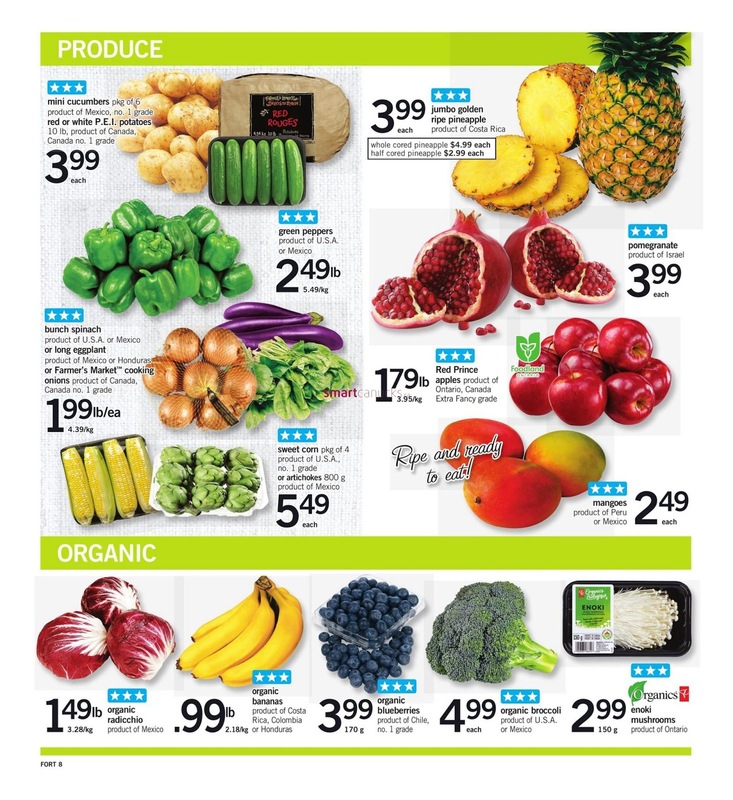 Peaches or Nectarines or Dole Spring Mix $2.77/lb Sale Price Peaches or nectarines product of Chile, no. 1 grade or dole spring mix 312 g, product of U.S.A. $6.11/kg.